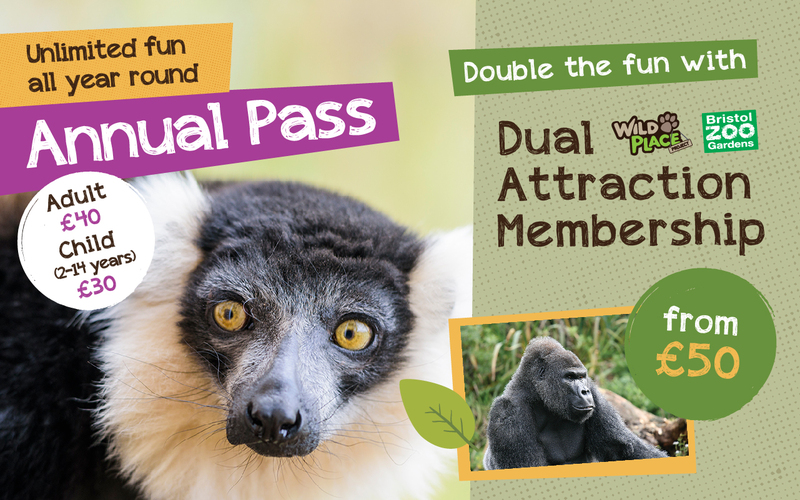 Become a dual member and enjoy unlimited visits* to Wild Place Project and Bristol Zoo Gardens! Go on a variety of outdoor adventures at Wild Place Project visiting exciting animals from Madagascar, east Africa and the Congo plus you can enjoy an amazing world of animals within the spectacular, award-winning, 12-acre gardens at Bristol Zoo Gardens too. We provide a child-friendly environment at both attractions, where your little monkeys can go wild in our water play area Splash!, at Bristol Zoo Gardens, or scramble up the net or slide down the fireman’s pole in the undercover Fun Fort play area at Wild Place Project. Free (fast track) entry to Bristol Zoo Gardens*. Discounted entry for friends and family all year round at Bristol Zoo Gardens and Wild Place Project*. Free entry to selected UK zoos and safari parks. Currently Colchester Zoo; Belfast Zoo; Chester Zoo (one visit per year); Edinburgh Zoo; Marwell Zoological Park (one visit per year) and Woburn Safari Park (one visit per year). This benefit is facilitated by other zoos and is subject to change at any time. Discounts on selected events, Leap of Faith, ZooRopia and car parking at Bristol Zoo Gardens. 10% discount on your dual membership fee after a year’s continuous membership. 10% discount on purchases in the Bristol Zoo Gardens and Wild Place Project gift shops*. Minimum £5 spend applies. Discounted birthday parties at Bristol Zoo Gardens and Wild Place Project (if the birthday child is a member).